Kids get creative working with paint or clay. 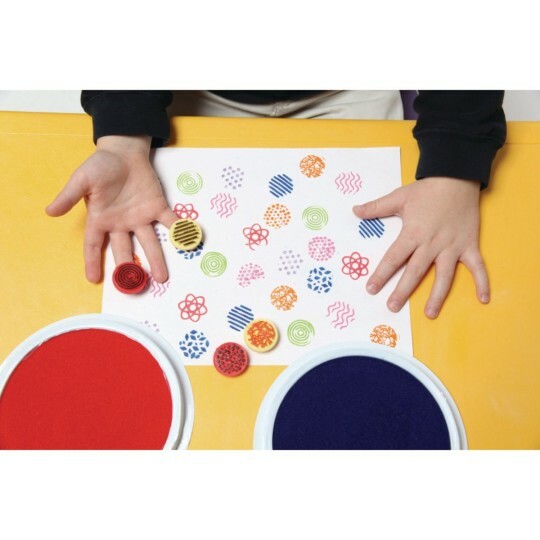 This set of 8 finger printers let a child's imagination run free working with paint or clay. The diameter of each hard rubber stamp is 1-1/8" across and slips easily onto one or two fingers, depending on the size of his or her hand. Easy clean-up with soap and water. The patterns are concentric circles, branches, waves, overlapping ovals, dots, parallel lines, stars and diamond shapes. For 3 years and older. 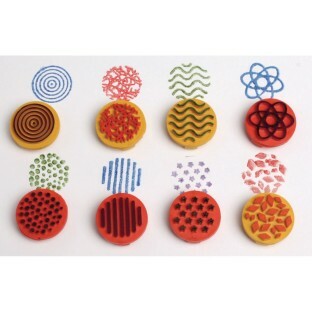 I use these as stamps for ceramic pieces I make and in my classes. They provide a clean impression clean easily and last well. A nice variety of designs.